Das Eyland Baly oder Klein Java. 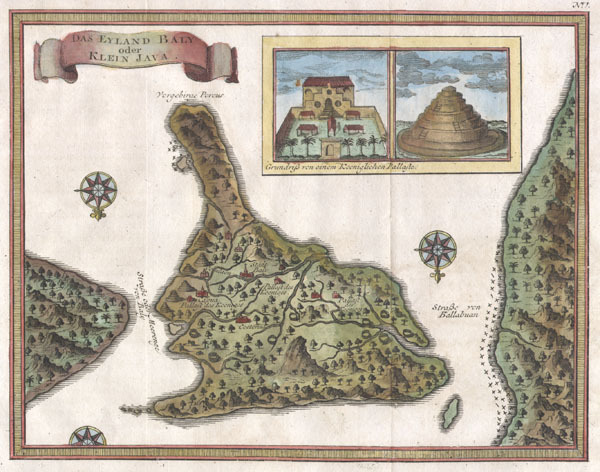 An extremely attractive little map of Bali, Indonesia, by French cartographer J. Nicholas Bellin. Depicts the island oriented to the south. Offers wonderful detail of the inland rivers and villages. Upper right quadrant features an inset of the Royal Palace and a Balinese temple. Two and a half compass roses decorate the image. The island of Java is shown to the right and Lombok to the left. The upper left quadrant features a banner style title cartouche. Most likely prepared for the Dutch edition of Provost's L'Histoire Generale des Voyages. Very good condition. Original publisher's crease. Else clean and fine.